The whole “buy a car and get a free gun” schtick is nothing new. Dealers have been doing this for years, but one dealer in New Hampshire is facing criticism for giving away a rifle similar to the one used in the tragic killing of 49 people in Orlando last weekend. 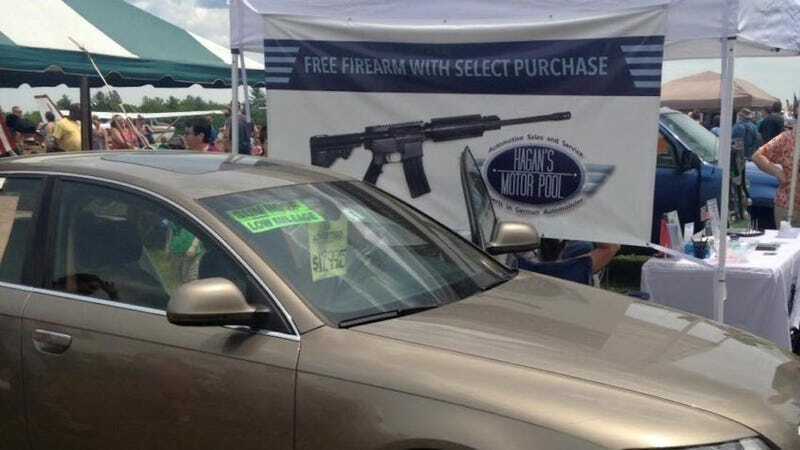 According to Fox25, owner Mike Hagan of Hagan’s Motor Pool in Rochester, New Hampshire is offering a free AR-15 rifle or a handgun with the purchase of selected pre-owned vehicles. Hagan, who is a military veteran and served in Afghanistan, said the possibility of the rifle being used on civilians doesn’t weigh on his conscience. Of course the car buyer doesn’t get a firearm at the time of purchase, but rather a voucher to go to a local gun store that they can cash in for either the AR-15 or 9mm handgun. Anyone that wants to use the voucher must pass a background check. I’m not here to get into a debate whether or not Americans should be owning these kinds of weapons. However, as someone who helps people buy cars for a living, I can say that dealerships that give things away for free are more often than not overcharging for their cars. For example, here is a 2012 Kia Optima LX with 54,712 miles with an asking price of $12,895 and that includes the free firearm. There is no information on whether or not the car has an accident history or was regularly maintained. Hagan’s Motor Depot does not provide a free link to a vehicle history report. Not far away is a 2013 Kia Optima LX with only 35,000 miles for only $100 more. This is a single-owner car with a clean history report. If you are going to get a military grade weapon for hunting, you should probably also have a truck to haul whatever it is you kill with that kind of firepower. Hagan’s has a 2004 Ford F-150 XLT 4x4 that qualifies for the weapon giveaway. This truck has 133,616 miles and an asking price of $11,995. I would recommend you spend an extra grand for this F-150 XLT 4x4 with only 73,000. It’s pretty much the identical truck, but with almost half the miles for not much more. As a business owner, Hagan can use whatever promotion he sees fit to sell cars. But some may argue that giving away the same kind of military style weapon that was used for the biggest mass shooting in American history, is a callous attempt at using a national tragedy to generate buzz. And as we can see from these prices, he and other dealers use “giveaway” a bit loosely.